Sometimes it takes city street savvy and tenacity to endure the changes that living in an end-of-the-road mountain town brings, but that’s just what Cathy Steinberger brought from New York to Crested Butte back in 1977 when she found the dusty little defunct mining town and had to learn to chop wood, shovel snow and start a proper fire. Cathy grew up in Forest Hills, Queens, which was then the home of the U.S. Open Tennis Tournament, where, as a kid, she’d sneak under the fence to watch the games. Her father was a CPA tax attorney and during tax season she’d get to tag along to his Manhattan office and play with the adding machines and the wet copier. High school offered typing class, which most girls signed up for in those days, and Cathy claims it actually came in handy in the computer age. “I’ve always been smart but I never liked high school,” she confesses, relaying that her school was so big they had to have three split sessions a day to accommodate all the students. Nevertheless, she graduated in 1965. Other than living in the Big Apple, Cathy didn’t know in what direction she wanted to go, so her parents sent her to a school in Switzerland instead of college. She studied French and French history and learned to ski, although she admits that she never really embraced the sport after returning home to the States. “I traveled with school trips and I loved it because first of all, I was on my own. It was an all-girls school and I met a lot of wonderful women from all different countries,” she recalls fondly. But when all was said and done, Cathy was ready to come home and reflect on it as a great experience. She moved into a tiny, walk-up apartment with bunk beds in midtown Manhattan and began the search for employment. “I had to get a job and the only skill I had was typing,” she smiles. She landed an administrative position. “It was my first lesson in business and inappropriate male behavior. The job didn’t last long because my boss put the moves on me, but afterwards I found a great opportunity and adventure through the Liberty Travel School,” where she became a travel agent. “They had a lot of company familiarization trips and discounts on travel, so I traveled from the Caribbean to Israel and everywhere in between. Beaches were my favorite, and still are,” she says. When an old family friend called to ask her to be his cashier in a new store he was opening in Queens, she accepted. “It led to a career in retail. I became his operations manager, scouting new locations and setting up five new stores in NYC.” She worked for him until 1977, when she moved to Crested Butte. Cathy discovered Crested Butte in 1971 when she and her former boyfriend visited a group of their NYC friends who had relocated to the then-comparatively unpopulated town. “Honeydew Murray and Terry Stokes, Tommy Jacobs and Corinne Barr and John and Iris Levin—the three couples had bought the Grubstake and left NYC. The streets weren’t paved and there were only about 350 people living in town. I fell in love with Crested Butte but my boyfriend didn’t. We liked the mountains and the fishing but he didn’t like the hippie lifestyle. But I did,” Cathy says. Early that autumn, the city girl decided to try mountain life in Crested Butte for a few months. “I was just ready for a change. I drove out with my ex-significant other, in my old Saab, promising my family I’d be home for Thanksgiving,” Cathy says, and she went so far as to sublet her Manhattan apartment and took a leave of absence from work, since she thought she’d be back there soon. She quickly realized that should she return to NYC it would be the same old story. “I knew exactly what I was going back to,” she felt of the predictable grind. The few months of living in a small, close-knit community had changed her and she liked its potential. “So I kept delaying and delaying until I finally made the right decision to move here.” She notes that the job market wasn’t robust back in those days and most did whatever they could to eek out a living with several jobs, much as it is today. “Lynda Jackson was one of my first friends and one of our first jobs was working together for Earth Station, where I sold ads. But I didn’t realize I had to write those ads as well! My good friend Pat Crow and I did anything and everything to earn a living before finding careers here. Pat was a great chef and at the end of the season we did catering for the restaurants for their employee parties. “We also did the first marketing piece for the town of Mt. Crested Butte. We created a rack card with photos and info about the town,” Cathy says of their diverse entrepreneurial skills. 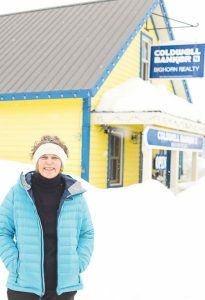 Cathy says she feels like she grew with the town, as did Coldwell Banker Bighorn Realty, the company where she’s been a broker and operations manager for 30 years. The past few years Cathy’s been on the board of the Gunnison Valley Health Foundation, which funds things like medical equipment, new ambulances, and the popular wellness fairs. “That’s what you have to do here to be part of the community—you have to be involved beyond your work life,” she says of being a volunteer.